Interested in a Dogtopia franchise? If you meet the financial investment criteria, have transferable skill sets and experience, and are interested in proceeding to next steps, please contact us. Why choose the pet industry? The pet industry is a $70 billion industry and poised to continue to grow rapidly. Driven by the humanization of the dog, 92% of pet owners spent the same or more on their pets during the most recent recession period, according to Forbes. The pet industry is recession-proof, boasts good margins and is an exploding market. It’s predicted to surpass $100 billion by 2021. Why choose a dog daycare? With 90M dogs in U.S. and pet owners spending an all-time high of $69.51 billion on their pets annually, dog daycares are here to stay. It is a scalable business model with multiple revenue channels (daycare, boarding, training, spa, retail), with the majority of total sales coming from consistent recurring daycare revenue. A dog daycare business requires little inventory and is fun to run. As one of the early pioneers in the dog daycare industry, we’ve had more than 16 years to refine and perfect our model. As an emerging brand, Dogtopia is experiencing impressive growth. The demand for our brand, flexibility of our model and the availability of prime territories is fueling our growth. 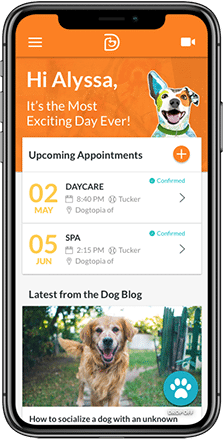 There has never been a better time to join us and be the first to bring Dogtopia to your community. One of the prime benefits of teaming with an brand like Dogtopia is the ability to cherry pick prime markets to open your daycare center. You have the chance to own your own Dogtopia where you know people and have connections. Who is Dogtopia’s ideal customer? We tend to attract the female millennial, generally whose dogs are treated equally (or even better than) human children. Our secondary customer is the baby boomer (empty nester), often whose children have left the home and who are soon replaced with furry children. Is Dogtopia part of a franchise association? Yes, Dogtopia is a proud member of the International Franchise Association. 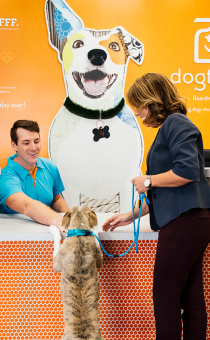 Currently Dogtopia has more than 90 locations open in North America. 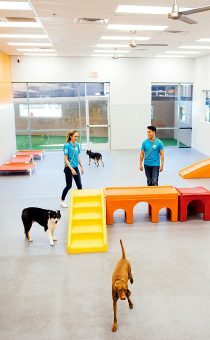 Dogtopia is positioned to become the leading dog daycare franchise in North America. The brand launched a very aggressive growth initiative to rapidly grow its footprint to more than 400 locations in the U.S. and Canada over the next several years. Most prime markets are still available and we will provide assistance in finding the best market for your daycare center. The estimated initial investment for a dog daycare facility can range between $601,695 and $1,322,195, with the average investment at $750,000. The initial franchise fee for multiple units is discounted by 10%. Our spacious, modern facilities average between 4,500 and 7,500 square feet. Each location is specially designed to provide dogs and dog parents with the best experience possible by reducing odors, noise levels and the risk of illness and accidents. Our locations are equipped with live webcams to allow pet parents to check in on their dog throughout the day. How many employees do you need to run a unit? You need 10-15 employees to run a unit. Who is the ideal Dogtopia franchisee? A background in management/business experience is helpful, but not required. A Dogtopia franchisee’s skill set should include sales, management of personnel, training, marketing and customer service. The ideal candidate must love dogs and LOVE the business of dogs.